This year’s BRDC Clay Pigeon Shoot, held on Wednesday 21 September, was a great success and for the first time ever there was a tie at the end of the day, resulting in shoot off! Held again at the EJ Churchill Shooting Ground , amidst 40 acres of woodland on the stunning West Wycombe Estate, the day was blessed with good weather and a strong attendance. 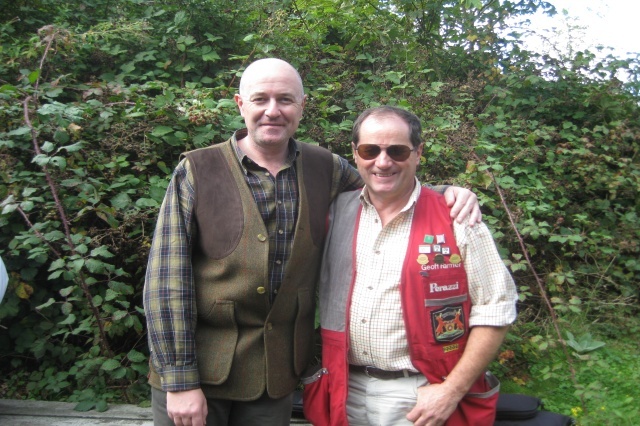 Nine teams competed in two sessions, some of whom were experienced and for others it was their first time on a shoot. At half time the scores were close and by the end of the day William Hewland and Geoff Farmer, both on top form, ended up tying for first place. The pair went off for a shoot off (and not, as was suggested a duel) and it was the winner of the last six years, William who managed to keep his title (by a single point) and take the trophy home for another year! Having now achieved a record seven successive wins William announced his intention to stand down from the competition. Another Member celebrating at the end of the day was Ian Ashley, who won the Novice category, having last shot in 1976!